One of the things I love most is to combine history and food. And no one does it better than David Downie, in his new book, A Taste of Paris: A History of the Parisian Love Affair with Food. 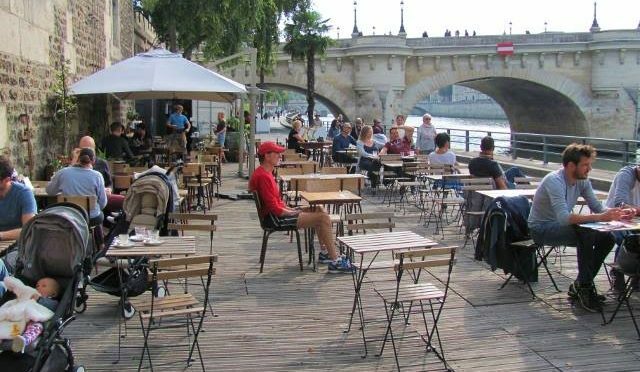 In A Taste of Paris, Downie traverses time and space (cultural space, that is) to bring us the history of food in Paris over the last 2,000+ years. 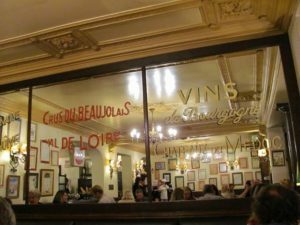 In doing so, he explores Paris and shares with us places from antiquity (and today), cultural changes, restaurants and reviewers, home cooks and chefs, important food people in the history of Paris, recipes, and more. A Taste of Paris is a book I couldn’t put down, a book I love, a book I’m very happy to recommend to our readers. Do we have 90,000 words for this? No? Then anything with wings, lots of fat, crispy skin. Confit de canard or goose, or a perfectly roasted chicken, are hard to beat, but I can also think of 20,000 other things I love to cook at home including a casserole of vegetables and cheese baked for hours at low heat, unctuous inside, crispy on top, redolent of greens and curds. Everything needed to feed a king and royal court. Also, at least one chilled bottle of fine white wine, often a Sancerre or Menetou-Salon, sometimes a nice little Vire’-Clesse’ from the Maconnais, hugely unrated, all of them organic needless to add. Well, chewing with her mouth closed and wielding the flatware with skill, naturally. They are a prerequisite for undistracted, intelligent conversation, preferably about history, the arts, literature or politics, never food or wine, honestly, though, as I enter my seventh decade, reminiscences are also appreciated, in other words, I love my wife and love sharing meals with her. She is the ideal dinner partner and after 30 years get better by the day. The opposite of what I’ve outlined above. Above all, loudness, vulgarity, and the clumsy placing of dirty implements on the tabletop or the edge of the plate. Also I currently find it impossible to share a meal with anyone bent on defending the politics of 45. That is an act of indecency. If I name a living author other than Paula Wolfert, who is not only great but a wonderful human being and a mentor, if I have such a thing, the ones I fail to name will seek to murder me with a sharp knife. How about someone long-dead and uncontroversial like Apicius or, if you insist on modernity, Massialot, for a time Louis XIVth’s valet/maitre d’ and the inventor, it is thought, of crème brulee? I give his recipe for it, with fixes, in A Taste of Paris. The fly swatter. Just kidding. Sort of. The mortar and pestle taken together must be among them, the whisk is another. I’m an amateur home cook, but if I’m allowed to be immodest and you will agree to dine with me, I suppose I would make you something Italian, French, or improvised Californian, in that order. Surely you jest? I would pay to never eat tofu again. The first three choices are equally swell. I would refer you to my earlier answer about favorites, including duck. I’ve come to love cows, so eat little beef these days and while I like pigs, I cannot resist cooking them in a thousand ways. As one of the fathers of French gastronomy, Grimod de la Reyniere, said, they are the “encyclopedic animal.” Everything in them, leaving aside the contents of their bowels, I would think, is good to eat. It’s tragic for the species but I can do nothing to save them from their own deliciousness. Artichoke: a great aphrodisiac, especially if you believe in aphrodisiacs. Let’s go with another dead one, for safety’s sake: Raymond Olivier. 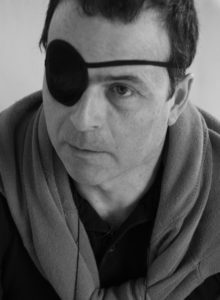 He ran Le Grand Vefour at the Palais Royal in Paris for decades, had three Michelin stars when they meant something, but wasn’t smarmy or cynical, and actually did the cooking himself. He helped nudge French cuisine from the glom and goo and silly flimflam of Escoffier into the modern age. He also happened to be the first chef ever, anywhere, to have a TV show about food. That was in the 1950s, long before Julia Child who was, by the way, a huge admirer of his and a regular at Le Grand Vefour. Egad, we need another 90,000 words. Simple food, delicious, wholesome food, authentic, satisfying real food, food that tastes like food and not silly putty styled by sorcerer’s apprentices calling themselves great chefs and artists! Give me a leg of lamb roasted with rosemary and garlic, a poule au pot, a blanquette de veau, a plate of pasta alla carbonara without whipped cream for chrissakes, and no daubs of color and edible skyscrapers on an outsized designer dish! See my last answer and add in processed or semi-processed karaoke cooking made by microwave practitioners serving schlock to tourists, cyborgs, and bobos born without taste buds. Who do you most admire in food? Without naming names, because I fear the knives and tongues of fanatical foodies: those who are modest and sincere and nurturing and do not seek to turn tables and ravish wallets or torture diners with high-stools and other discomforts for the infantilized, taken by many in the business as prerequisites to hipness, chicness and sophistication. The latter three are inimical to good eating. If I tell you on the Internet I’ll never be able to get a table again. Read my book and you’ll go on a treasure hunt and discover all of my many favorites in Paris. My thumbs, in particular, are permanently stained by the juice of artichokes. If stretch marks are tattoos, then all of them are food tattoos, at least, they are caused by the overindulgence of food, and make me resemble lardo di Colonnata or perhaps some French country ham. Take four or five egg yolks, it depends on the size of your serving dish. Stir them together in a casserole (or nonreactive pot maybe) adding a generous pinch of flour (I’d skip the flour and add the four tablespoons of sugar the chef forgot to mention). Pour in two cups of milk a little at a time and keep stirring. 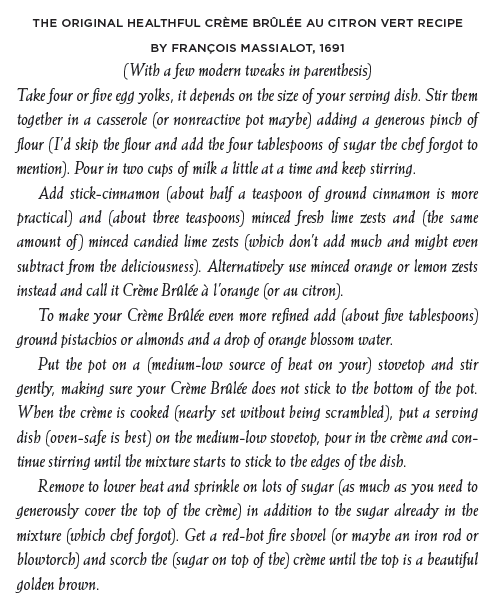 Add stick-cinnamon (about half a teaspoon of ground cinnamon is more practical) and (about three teaspoons) minced fresh lime zests and (the same amount of) minced candied lime zests (which don’t add much and might even subtract from the deliciousness). Alternatively use minced orange or lemon zests instead and call it Crème Brûlée à l’orange (or au citron). To make your Crème Brûlée even more refined add (about five tablespoons) ground pistachios or almonds and a drop of orange blossom water. Put the pot on a (medium-low source of heat on your) stovetop and stir gently, making sure your Crème Brûlée does not stick to the bottom of the pot. When the crème is cooked (nearly set without being scrambled), put a serving dish (oven-safe is best) on the medium-low stovetop, pour in the crème and continue stirring until the mixture starts to stick to the edges of the dish. Remove to lower heat and sprinkle on lots of sugar (as much as you need to generously cover the top of the crème) in addition to the sugar already in the mixture (which chef forgot). Get a red-hot fire shovel (or maybe an iron rod or blowtorch) and scorch the (sugar on top of the) crème until the top is a beautiful golden brown. 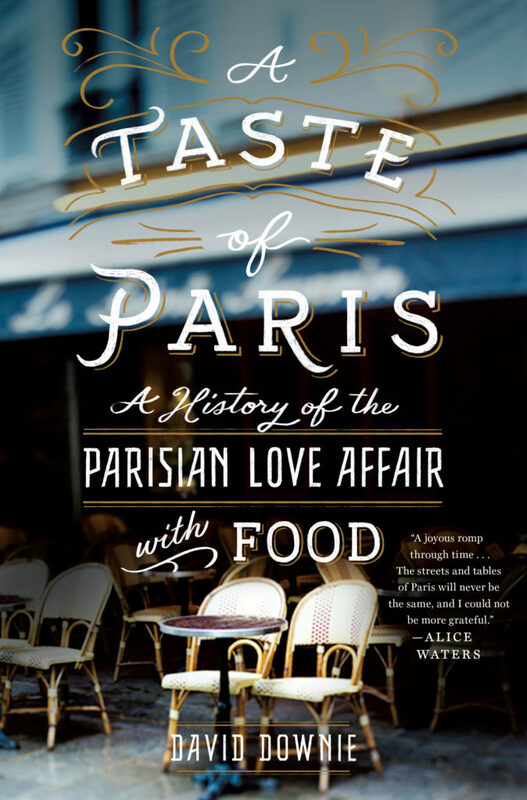 Excerpted from A TASTE OF PARIS: A History of the Parisian Love Affair with Food by David Downie. © 2017 by the author and reprinted by permission of St. Martin’s Press.